Doug was born and raised in Montgomery, Alabama and quickly realized that he had an affinity for entertainment. After being put out of a local high school rap group because his rhymes were more humorous than serious, a friend suggested he give stand-up comedy a try. So Doug stepped on stage at a comedy club in Huntsville, Alabama for the first time and found his calling. 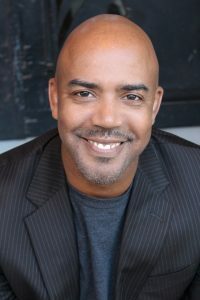 His off-beat style of stand-up comedy that often surrounds relationships with women and his life made him a favorite on BET’s (Black Entertainment Television) “Club Comic View” and “It’s Showtime at the Apollo.” He has been featured on “Comedy Central Presents Doug Williams” Doug’s talents as a comedian/actor led him to be cast as a series regular in the role of Kevin on the HBO’s series “The Mind of the Married Man.” Doug has also guest starred on “The Bernie Mac Show,” and “Close to Home.” He is starring in the up-and-coming feature film “The Trace” with Billy Dee Williams and Lynn Whitfield. Doug is the first Black comedian to create, host and produce his own stand-up comedy series, and it was the Starz Network’s first original hit series “Martin Lawrence Presents 1st Amendment Stand Up.” The late-night stand-up comedy show featured some of the nation’s legendary, established, & hottest up-and-coming urban comedians. The show ran for five successful seasons and helped add to the resumes of “The Hangovers’” Ken Jeong and “The Talks’” Sheryl Underwood. 1st Amendment Stand-Up was the number one rated show on Starz for five years and pave the way for other original series like “Boss,” and “Spartacus.” Doug went on to produce “Way Black When” for The TV One Network. The high rated series was featured during Black History Month and focused on the dramatic, musical, and comedic portrayals of African Americans through the lens of black music, film and television in the 70’s, 80’s and early 90’s. Presently, Doug has formed DNA Media Productions with his wife Ada Luz Pla-Williams. They have several projects in development. Currently they are creators and co-executive producers of “Runnin the Streetz with Doug Williams.” A fast paced comedy show built for today’s A.D.D., “YouTube” mixed cultural audience. The show contains outrageous sketches, celebrity guests, street pranks, and today’s hottest music performers.